1 of your 5 a-day. In a rich and tasty tomato sauce. 5 a day: portion size: 1/2 can. Source of fibre and protein. 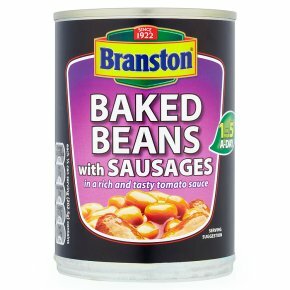 Free from artificial colours, flavours and preservatives.Our Classic Baked Beans, in a delicious rich and tasty tomato sauce with real pork sausages are the perfect way to make any meal time special. Try with toast, jacket potatoes or with your evening meal. (Based on 750W Oven) Empty contents into a microwaveable container, cover and vent. Heat on full power for 3 minutes. Stir halfway through. Allow to stand for two minutes. Stir before serving. Heating times are a guide only. Adjust times according to your appliance.